I picked up a gay time and a night club a couple weeks ago. I have spent a number of evenings and weekends cleaning, lubricating and such. When I turn the machine on non of the lights come on. I have gone through and checked all pin connectors, all are very snug. I can put credits on and I can hear the machine stepping up but nothing is lighting up telling me what options are available. When I run a ball through the launch chute the shutter closes and when I place the ball in a number hole the number doesn’t let get up either. Please help. I have e replaced them all!! 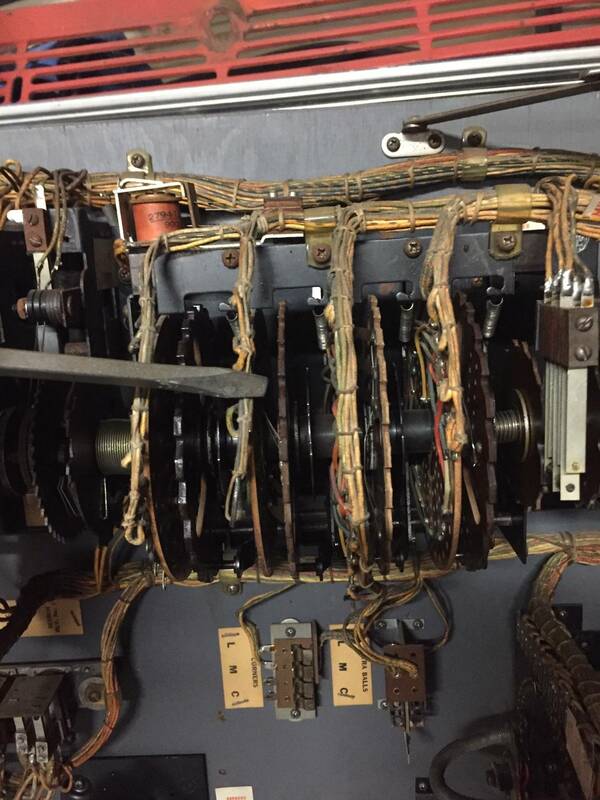 The fuses or the holders? Either way, do you have 6VAC where the voltage comes out of the transformer? How about at each end of the fuses? Your anti-cheat relay is the most likely suspect, assuming your fuses and holders are good. Are your playfield lights on? Yes, Playfield lights are on. There are a few lights on, but not the ones I’m looking for. There's a switch on the anti-cheat relay that travels between two states (single pole, double throw) that is suspect, as well as the two 8A fuses and the holders themselves. The switch wire colors in question are Yellow with a black tracer and white with a green tracer. Both of these wire colors should be next to each other on the anti-cheat. Look carefully at the switches involved and make sure that when the relay armature pulls, the switch changes state. The switch might be dirty, misadjusted, or it's a fuse conductivity problem. If you're hearing other items move and tick up, then the problem is not a dropping 50V (where the anti-cheat is dropping out of circuit). So that leaves the simpler single switch and couple of fuses. I will check those out!!! Thank you!!! 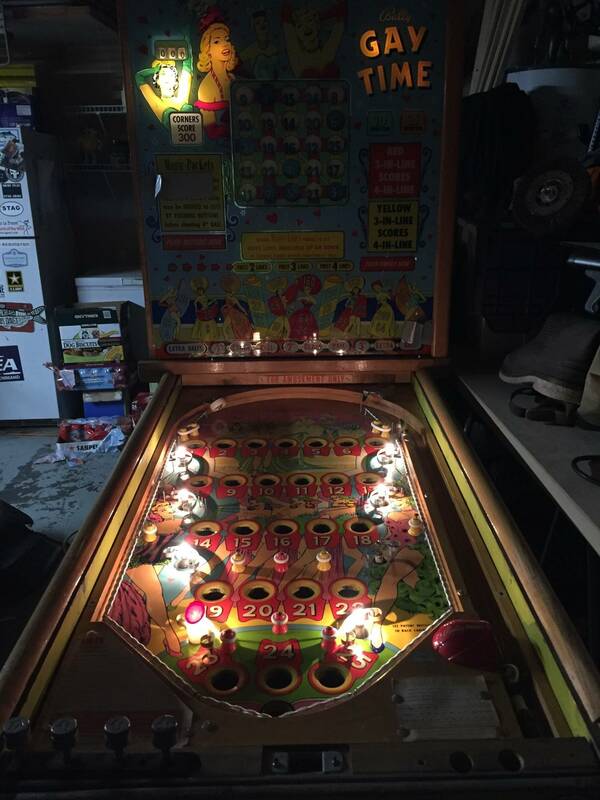 It looks like you have Playfield lights and I see a light on the Backglass lit near the 'game counter, so you have 6volts on your Pin. Looks like you are missing the 17volts for your 25 ball grid for scoring. It also looks like you are missing the 'odds lights' when you hit the Red Button; I think those are the lights you are talking about. I would clean the 'anti-cheat' and 'tilt' relays..... since you are not getting the 17volts to the grid. *** As stated by ' Bingopodcast'. * I eliminate the anti-cheat relay by cutting the 'hot' coil input wire and shimming the relay to the ON position. That way you don't reset the score counter when turn the power off/on. Those will be the things I do tonight!!! Awesome help!!! Thank you very much!!! burnt out every position light! is sometimes a good thing to do!!! No declaration here. It’s the game. Any progress with the lighting ? That’s a negative. I haven’t had a chance to get to it, I have been playing my other bingo the last couple nights and the World Series. I’m gonna hit it hard tonight though!! I would call Gary Conway for help but he is away on business. lights and the 17V. going to the score grid. I have "Gayety' the sister Bingo to your 'Gaytime'......... similar but yet different. This thread is why one shouldn’t read pinside with a buzz. I have gone through and have cleaned the contacts on the tilt and the anti chest relays. At one point I got the odds to light up. Now they don’t. I noticed there is a cam wheel that constantly turns on the upper part of the door. And it loOks like the rod that would engage to stop it has a groove ground into it. Seems suspect!! It’s mixer #3 it continually rotates and never stops. I think I’m gonna have to wait for Gary Conway to get back into town so he can assess my game. Unless there is someone else in the Seattle area that knows these machines!! There's a latch above mixer 3 that should drop in and latch mixer 3. It's probably just gunked up. You can see it from the top of the unit. Not your lamp problem though. If your anti cheat adjusting got your odds back temporarily, I suspect it's still not quite right or dirty. Please look again. Then if still not working, check the tilt trip relay. So after further inspection the roller on the actuating arm has a roller that rolls on the cam, it is worn in half. The roller is. I now have lights!!! The odds only come up to the second level. But the magic pockets work and the magic lines work also. I need to replace a couple light bulbs but for my first effort of working on machine by myself I’m very happy!!! Thank you to all who gave great sound advice!!! if mixer 3 isn't latching/stopping, you may have trouble getting score advance beyond the second level and extra balls. it is possible to remove the mixer latch arms without moving/removing the mixer shaft or mixers. note those pages talk about a game with 5 mixers instead of 4 and there's a mixer latch coil on each end of the shaft, but the assembly is basically the same. You are spot on with the score advance!! Wow, I’m very impressed, your not even here to look at it and know what I’m talking about. I will work on this this next weekend. Other than that one issue, the gam plays great and the magic pockets and magic lines are really cool to operate!!! to get rid of all the gummy residue they accumulate over years of use. I just cleaned a mixer on one of my Pins. If you release the locking bar at the bottom of each mixer, you should be able to rotate that mixer by hand. They rotate toward you in normal operation. They should rotate freely( somewhat); if not they should be cleaned otherwise that small motor may burnout. Here is a link that shows a dis-assembly......... he mentions about CLEANING.